Designed for today’s active families, this unique formula harnesses the power of enzymes to deliver potent effectiveness against your toughest odours and stains. Over 7.5 times more concentrated than most leading brands, it effectively helps reduce all kinds of odours and stains with just a few pre-measured pumps. A little bit goes a long way! Your family deserves to have their clothing smell and be as clean as it looks—free from harmful chemicals, fillers and questionable “fragrances” consisting of who knows what. In addition to containing harmful chemicals, some detergents don’t eradicate stains and odours. Our ultra-concentrated, USDA certified biobased Liquid Laundry Detergent has been tested against the toughest odours and stains. The unique blend of enzymes easily breaks down and removes all kinds of odours and organic stains, getting your laundry exceptionally clean. 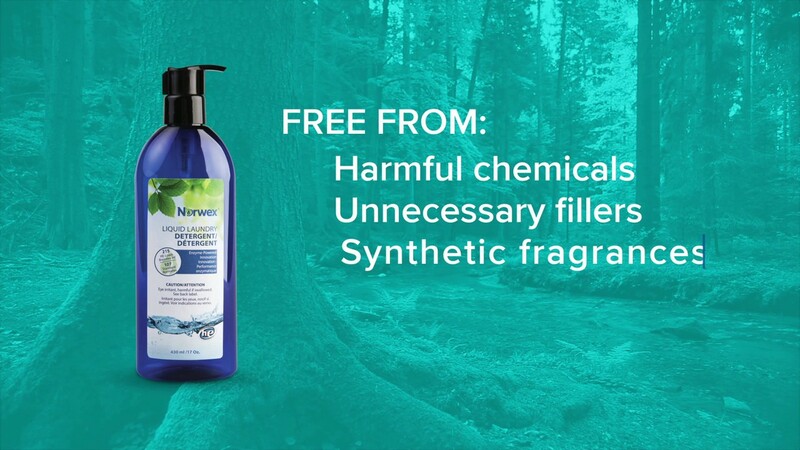 Best of all, you never have to worry about harmful chemicals like bleach or added fragrances. It’s tough on dirt, not the environment. • Smaller package means less packaging waste. (Please always remember to rinse and recycle). Enzymes are catalysts and function similarly to the way they do within our bodies— quickly helping to break down starches, fats and proteins. This makes them very effective at removing grass, sweat, blood and grease stains and more. The major fillers used in are insoluble materials that cause accumulation and buildup in washers, pumps, pipes, drain lines and septic tanks—and they can also end up in our waterways. Liquid Laundry Detergent dissolves completely and does not accumulate or build up.